Russia rejects Ukraine gas plan Jump to media player Gazprom has reaffirmed its Monday deadline for Ukraine to pay its debts after talks between Moscow and Kiev ended without agreement. How dependent are we on Russian gas? Jump to media player With relations worsening between Ukraine and Russia, ministers are investigating ways that European countries can become less dependent on Russian energy sources. China and Russia in huge gas deal Jump to media player China and Russia have agreed a huge gas supply contract in Shanghai after a decade of talks. Can huge ship solve search for gas? Jump to media player There are fears that the flow of gas to Europe could be disrupted because of the growing crisis in Ukraine. David Shukman reports. Gazprom has reaffirmed its Monday deadline for Ukraine to pay its debts after talks between Moscow and Kiev ended without agreement. The Russian gas giant said it will cut Ukraine's supply if Kiev fails to pay $1.95bn (£1.15bn) by 06:00 GMT. 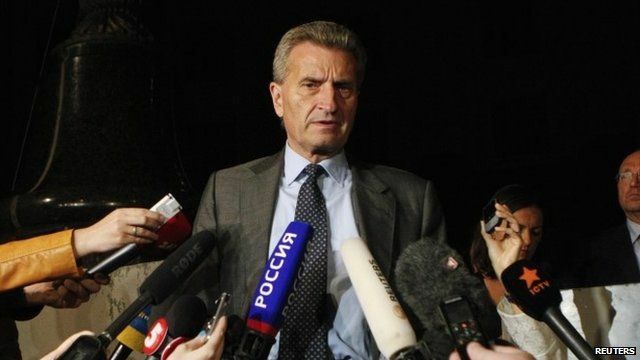 European Union Energy Commissioner Guenther Oettinger urged "more flexibility", insisting that the sides could come to a solution. Go to next video: How dependent are we on Russian gas?